Last night I finally got an item checked off my bucket list: I got to see Full Metal Jacket in the theater to celebrate its 30th anniversary. This is truly one of the greatest war movies of all time. 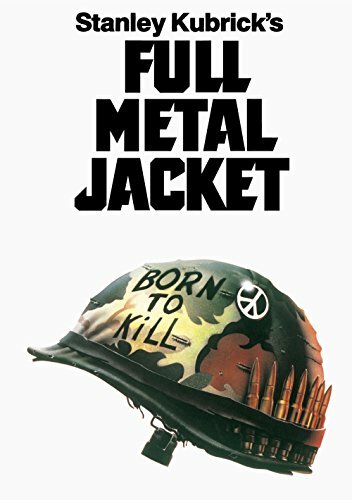 Full Metal Jacket focuses more on its story and characters, however it still has great action and thrilling sequences. With all of the new movies that have not lived up to the hype in theaters right now I strongly suggest you rewatch Full Metal Jacket; it will take away some of the stench Zach Snyder has left on the DC Universe. This is one of Stanley Kubrick’s best movies. You will find great dialogue and superb acting. I can honestly say Full Metal Jacket made me appreciate two of the stars…… Vincent D’Onofrio aka Private Gomer Pyle and Matthew Modine aka Private Joker. Both actors were born for the roles they portray. However, as we know, both are fully capable of portraying many types of roles. By far this is my favorite go-to movie just about any day. I have various copies of the movie to match the continuing growth of media since it premiered 30 years ago. For first timers watching I will warn you this is an edgy, vulgar picture. The movie takes place in two distinct acts during the Vietnam War. Act I is Marine Boot camp followed by Act II in Vietnam. In Act I we are introduced to the main character Private Joker (Modine). You are given brief narrations by Matthew Modine throughout the movie to help summarize and keep the movie flowing. While Modine’s performance is outstanding, two supporting actors steal the show during boot camp. Private Pyle played by Vincent D’Onofrio and Gunnery Sergeant Hartman played by R. Lee Ermey. For D’Onofrio and Ermey this is their first breakout roles and boy do they breakout. D’Onofrio portrays Private Pyle as a large, clumsy, awkward Marine who is belittled and completely broken. A scene that finally puts Private Pyle over the edge is the blanket party. It helps straighten up Private Pyle making him a machine, however, he couldn’t find a happy medium and violently ends his storyline and that of Sergeant Hartman’s. Sgt. Hartman embodies what military drill sergeants really put recruits through. You can’t blame them since they were preparing young men to fight in a war far away from home with only your fellow soldiers to rely on. Just about every line delivered by R. Lee Ermey makes you shake your head and say wow. Boot camp is portrayed and carried by the military cadences and harsh dialogue that is used. Act II of Full Metal Jacket is the Vietnam War portion. We see Private Joker has now become a photo journalist for the Marine Corp going about his day to day activities. We see Private Joker walking around with his helmet with “Born to Kill” written on it and wearing a peace symbol on his vest. Basically Private Joker is embodying the feelings of many Americans at the time. They did not necessarily agree with the objective at hand but did so since it was what was called for them to do. We are reunited with a character from the first act during Joker's deployment. Much like the first Act, a supporting character steals the show. Adam Baldwin aka Animal Mother steals the show with his take no crap attitude. He is definitely someone you would want with you during the situations they encountered. Much like the first Act instead of military cadences we are given awesome throwback music of the times. From "Wooly Bully" to "Paint It Black" we are given various ranges of music to set up scenes. Even a Disney song pops in when you don’t expect it. “The Mick” Mickey Mouse is given his own military cadence. You will never forget it after you see and hear it. Full Metal Jacket is a well done military film with the perfect mix of drama and action. It's definitely not for everyone but for those who like they tend to watch it numerous times and will never forget the one liners the characters give throughout the movie. As a final note to those who have served or plan to serve in our military, I applaud you and your families.